Ji-Su’s being an average student at a highly prestigious Seoul high school isn’t good enough for her South Korean parents. They’re also pushing her to get into a top college and go on a series of seons (blind dates arranged by a matchmaker). Much to Ji-Su’s dismay and without much warning, they send her to San Francisco to attend a slightly less competitive school for her senior year, where they hope she can raise her grades enough to stand out among college applicants. 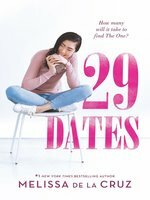 Ji-Su enjoys more freedom in America, but in matters of the heart, her parents continue to hold the reins: her seons mostly prove as disappointing as her ill-fated fling with a fickle boy from her new school. The story is interspersed with dialogue from Ji-Su’s 29 dates, adding structure to the tale and conveying the awkwardness of early relationships. De la Cruz (Someone to Love) offers a lighthearted romance about a heroine struggling to please her parents and be true to herself. Ages 12–up. Agent: Richard Abate, 3 Arts.